NCLEX-RN Practice Test (2019 Current). Answers Explained. Take this free NCLEX-RN practice exam to see what types of questions are on the NCLEX-RN exam. 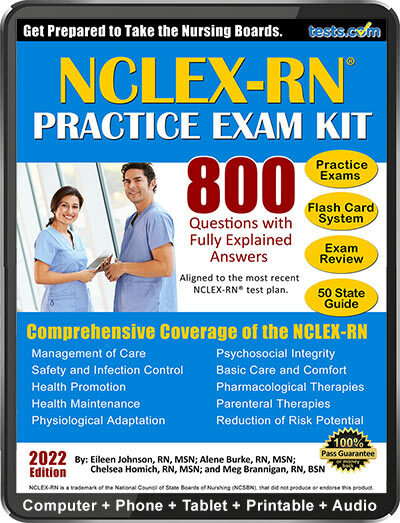 To prepare for your licensure exam, see the complete NCLEX-RN Practice Exam with 750 questions by nursing experts and medical writers, Eileen Johnson, RN, MSN, Alene Burke, RN, MSN, and Meg Brannagan, RN, BSN. 1. A nurse is putting together an educational seminar on advance directives. What information would be included in the materials? a. A patient may change a treatment decision in an advance directive if the patient's health care agent approves the change. b. When admitted to the hospital, a patient must appoint a Durable Power of Attorney for health care decisions. c. A health care facility must provide a patient informational material advising them of their rights to declare their desires concerning treatment decisions. Under Federal law, all healthcare facilities are required to provide patients with information on how to make medical decisions under Federal and State law, including accepting or refusing treatments and creation of an Advance Directive. The patient has the right to change a treatment decision in an advance directive, regardless of whether the patient’s healthcare agent approves or denies the change. It is the patient’s right to appoint a Durable Power of Attorney at the time and place of his choosing. It is not required for entry to a hospital. The healthcare facility is not required to provide an attorney to a patient to sign a living will. The patient needs to determine which attorney they want to hire or if they want to hire an attorney. 2. A nurse is advising a patient with Chronic Fatigue Syndrome on infection control procedures. Which of the following statements by the patient indicates that the patient understands the advice? a. I'm going to a basketball game tonight. b. I should avoid anyone with cold symptoms. c. I should have a blood test. d. I'm not going to attend functions with large crowds. A patient making this statement understands that one step in infection control is avoiding patients who have cold symptoms. This is important as the person with Chronic Fatigue Syndrome may be more susceptible to a virus or the virus may trigger more disease symptoms. The patient who verbalizes they are not going to the basketball game or are going to avoid functions with large crowds may understand that Chronic Fatigue Syndrome can cause the patient to become tired, but this does not indicate the patient understands infection control. Infection control measures can be implemented at events by following standard precautions, such as handwashing. If the patient stops going to social events, this can also cause the patient to become depressed and isolated. Infection control statements would more accurately be made about prevention of infection. A blood test would only indicate if the patient already has an infection. 3. Which of the following would be an expected finding in an age assessment of a 2 year old? At 2 years old child, a patient should have reached certain developmental milestones. The child will be developing their vocabulary and in addition to knowing almost 300 words, will be developing 2-4 sentences. The child may start using one hand to complete tasks and favoring one hand over the other. The child may start running, as well as walking and standing on tiptoes. A child who is lagging in performing these milestones may be at risk for developmental delay and further assessment is indicated. 4. A patient's spouse died three months ago. The patient says "I would like my friend Tom to have my collection of artwork because I don't need to look at them anymore". Which of the following responses by the nurse would be proper? a. Did Tom ask for the artwork? b. Are you planning to commit suicide? c. Does Tom know you want to give him the artwork? d. Why do you want to give the artwork away? It is appropriate for the nurse to ask this question of the patient as a close-ended question with two responses. The nurse can decide based on the patient’s response if further evaluation is needed. As to the other answer options, the focus should remain on the patient as it will be easy for the patient to sidetrack a conversation. In answer option d, it is an open-ended question and gives the patient an opportunity to evade further questions about the patient’s plan to commit suicide. 5. A nurse is instructing a patient on the use of a walker. Which of the following would be included in the instructions? a. While putting your body weight on your hands, step into the walker. b. Hold the upper handgrips. c. When seated, push off the chair to come to a standing position. All responses are appropriate for the nurse to instruct the patient in the use of a walker. It is appropriate for the patient to put the body weight on their hands, or onto the walker, as this will put less pressure on the weakened leg or legs. The upper hand grips are where the patient should hold the walker, not on the front of the walker, which could cause it to tip forward, or on the middle side rails, which are too low. The patient should push off of the chair to come to a standing position, not pull the walker to stand up, as this could cause them to fall as the walker tilts back. 6. A patient, who weighs 200 pounds, has a prescription for a Dopamine Drip at 5 mcg/kg/min. There is 400 mg per 500 ml D5W on hand. The nurse should administer __________ milliliters to the patient each hour. The correct answer is 34. First, 200 lb is 90.7 kg. Multiply the 5 mcg/min by 90.7 kg to get 453.5 mcg/min. Multiply the 453.5 mcg/min x 60 min to get 27210 mcg/hr. Multiply 27210 mcg/hr x 1 mg/1000 mcg to get 27.21 mg/hr. Multiply 27.21 mg/hr x 500 ml/400 mg to get the answer of 34 ml/hr. 7. A patient is to get an MRI of the abdomen. Which of the following instructions should the nurse give the patient? a. Do not wear metal objects during the MRI, including jewelry. b. Do not take oral medications up to 12 hours after the MRI. c. Do not urinate prior to the MRI. d. Do not eat solid foods 12 hours prior to the MRI. Metal objects should not be used near an MRI. An MRI, or Magnetic Resonance Imaging device, will not function properly when magnetic objects, such as jewelry are nearby, and can cause harm to the patient through the MRI pulling the objects away from the patient. Patients should be assessed for metal materials within the body as well, such as joint replacement or spinal hardware. Unless otherwise instructed, it is safe for a patient to take oral medications, eat solid foods, and urinate as usual prior to getting an MRI or following an MRI. 8. Which of the following symptoms would support a diagnosis of Crohn's disease? Rectal cramping and bleeding would be the most consistent in supporting a diagnosis of Crohn’s Disease. While it is unclear what causes Crohn’s disease, patients almost always present with these symptoms. Fatigue and headaches could result following blood loss in Crohn’s disease but would not be used to make a definitive diagnosis. People with Crohn’s disease may experience stomach swelling and gas. These are also symptoms of all types of IBD. They would not necessarily be used to make a diagnosis as these symptoms are present in many other intestinal-related diseases. 9. A nurse is teaching a staff seminar on patient confidentiality. Which of the following statements would be included in the presentation? a. Verbal consent is sufficient to allow family members to see a patient's medical records. b. If a family member is at the hospital, he or she would be entitled to an update on the patient's status. c. All hospital staff may have access to a patient's medical records. d. Consent to disclosure is implied when a patient is transferred from one health provider or facility to another. Consent must be in writing from the patient to allow the family members to see the patient’s medical record or receive information from care providers. Updates on the patient’s status should only be given with consent from the patient. This includes all family members, even a spouse. Under HIPAA laws, only staff operating in the direct care of the patient are allowed access to a patient’s medical records. 10. A patient has a prescription for Tylenol at 650mg every 6 hours. A nurse only has 325mg pills of Tylenol available. How many pills would be administered every 6 hours? 325 mg x 2 pills is equal to a total of 650 mg. Therefore, the patient should receive a maximum of 2 pills every 6 hours. It is important to verify the dosage of certain medications, such as Tylenol, to prevent overdosing a patient within a 24-hour period. 11. A patient is suffering from heart failure. Which of the following would be recommended by a nurse as part of the patient's health care plan? Swelling of the lower limbs, known as edema, is due to a buildup of fluid from an impaired circulatory system and is a common side effect of Congestive Heart Failure. It would not be appropriate to discourage fruits and vegetables, as they are part of a heart healthy diet and should be encouraged. Patients with heart failure are usually put on a water regimen of around 1-2 L of fluid total per day. This is due to the increased pressure on the heart to process fluids and may cause worsening edema. Patients with heart failure need to be careful with the amount of vigorous exercise activities they undertake. Heart rate should be monitored closely to prevent overexertion. 12. A patient has had diarrhea for the past 72 hours. Which of the symptoms would support a diagnosis of hypovolemia? Hypovolemia indicates low fluid volume within the body. Dizziness spells would be one symptom of hypovolemia due to the decreased pressure in the brain. Urine would be dark colored, not light colored, as the urine contains more byproducts and the kidneys process less fluid. An increased pulse rate would indicate hypovolemia as the heart works harder to spread the limited amount of fluid volume throughout the body. A patient would have dry mucus membranes as fluid is directed towards more vital body organs. 13. The spouse of a patient in a long term treatment facility asks a nurse for information about the patient's treatment plan. The nurse should respond as follows? a. Ask the patient for the information. b. I cannot give you information on any patient. c. The doctor will speak to you about the treatment plan. d. Can you give me the patient's Social Security Number? Unless the patient has given consent for information to be given to the spouse, the nurse should respond that no PHI, or Protected Health Information, can be given out. Treatment plan information would be considered PHI under HIPAA. It would not be appropriate to direct the spouse to the patient for the information. The nurse should already be aware of the treatment plan information and can ask permission from the patient to speak to the spouse. It is not appropriate for the nurse to pass the buck to the provider. In this scenario, the nurse should tell the spouse that information cannot be given. Even if the spouse knows the patient’s Social Security Number, the patient’s PHI is protected under HIPAA. 14. Which of the following infectious control methods should be used when caring for a patient with bacterial pneumonia? A patient with Bacterial Pneumonia may spread the disease through droplets from coughing or sneezing. Droplet precautions would be appropriate. A mask is required to prevent inhalation of droplets containing bacteria. Flowers can be allowed to be brought into the patient room as this should not worsen the patient’s condition, unless the patient has an allergy. Proper sanitization measures are acceptable when handling utensils used by a patient on Droplet precautions. Visitors can be allowed provided a mask is worn within the room of a patient who may be coughing. 15. A patient is brought to the emergency room by her spouse. The patient's injuries are indicative of physical abuse. Which of the following actions should be taken by the nurse? a. Question the couple about how their marriage is going. b. Inform the spouse that the patient's injuries appear to be the result of abuse. c. Inform the patient that she will have to speak to the police. d. With the spouse out of the room, question the patient about the possibility of abuse. Using therapeutic communication, the nurse should question the patient about the possibility of abuse. It is appropriate to talk with the patient when the spouse is out of the room as the patient may be fearful and not answer questions honestly if the spouse is in the room. It is not appropriate to question the patient when spouse is in the same room. It is not appropriate to approach the spouse with suspicion of abuse as this could cause further damage to the patient and make it more difficult for the patient to leave the abuser. The patient is not required to speak to the police. It is up to the patient to determine if they want to speak to the police, though the nurse can encourage the patient. 16. Which of the following advisements should a patient suffering from GERG receive? All of the answers are correct. A high-protein, low-fat diet is appropriate for patients with GERD as following this diet helps prevent symptoms of acid reflux. A high-fat diet may delay gastric emptying leading to more acid reflux. Remaining upright will help keep pressure off of the esophageal sphincter and allow the muscle to work appropriately. Limiting the intake of acid-stimulating food and drink will also prevent heartburn by calming the esophageal lining and preventing the esophageal sphincter from weakening. 17. A patient, who weighs 143 pounds, has a prescription for Garamycin at two mg/kg, IV, every eight hours. There is 100 mg in 50 ml solution on hand. The nurse should administer __________ milliliters to the patient with each dose. First convert 143 lbs to 65 kg. Multiple 65 kg x 2 mg/kg to get 130 mg q 8 hours. Multiple 130 mg x 50ml/100mg to get 65 ml q 8 hrs. 18. A patient is not to eat or drink anything 24 hours before a colonoscopy. A patient may be instructed to not eat any solid foods up to 24 hours prior to a colonoscopy, however clear liquids are typically allowed until midnight prior to the procedure up to a couple hours prior to the procedure. The nurse will need to verify the orders given by the physician. 19. Which of the following symptoms would a patient exhibit with hyperthyroidism? A patient with hyperthyroidism will present with the opposites of the listed symptoms. Too much thyroxine is produced, causing the body’s metabolism to rise. This leads to an intolerance to heat, a decrease in weight gain, increased bowel movements, a rapid heart rate, and warm, clammy skin. 20. A patient is having a tonic-clonic seizure. A nurse should take which of the following steps? Putting a pillow under the patient’s head is an acceptable way to prevent injury to the patient until the seizure has completed. Putting restraints on the patient may cause further injury to the patient and will not prevent the muscles from moving. Putting a tongue blade in the patient’s mouth may cause injury to the oral cavity and may cause the patient to choke. It is more appropriate to put the patient on the side as this may help to prevent aspiration as well as prevent injury to the head. a. The CIA protects us and is not out to hurt you. b. No other patient thinks that. c. I want to help you, not harm you. It must be frightening thinking people want to hurt you. d. When did you first start having these thoughts? The best therapeutic communication with a schizophrenic patient is to acknowledge their fears while also developing rapport with the patient as a nurse. This statement best meets those needs. A patient with schizophrenia will truly believe in the statements they are making, so the nurse should not try to convince the patient they are wrong as this may develop distrust between the nurse and patient. The focus should remain on the patient and their beliefs. The nurse should not bring other patients into the conversation. As to answer option d, this statement does not acknowledge that the patient’s thoughts are their reality. The patient may also not know the answer to this question and the nurse will not be able to develop rapport with the patient. 22. Which of the following patients should a nurse recognize as having an increased risk of breast cancer while doing breast cancer screening? The risk for breast cancer is increased in elderly patients who have not had children. Patients who have had children are at less risk for breast cancer than those who have not had children. Breastfeeding decreases the risk for breast cancer. A patient who started her menstrual cycle at age 12 would be a decreased risk for breast cancer. Patients with irregular cycles or who started at an earlier age may be at an increased risk for breast cancer. a. I will have your spouse explain the procedure to you again. b. I will call your doctor to explain the procedure to you. c. I will explain the procedure to you and answer any questions you have. d. Your appendix may rupture and that could cause serious problems. It is most appropriate to notify the doctor that the patient is rethinking about receiving the surgery. The doctor will need to discuss their options again and reinforce to the patient that surgery is required or not. It is not appropriate for the spouse to explain the procedure to the patient. This should be done by medical staff. The patient may have questions that can only be answered by the doctor, therefore the doctor should be notified. The nurse may not be able to explain the procedure appropriately and may cause the patient to distrust the medical staff, therefore the doctor should be notified as they may need to receive consent a second time. 24. While preparing for discharge, a patient makes the statement to the nurse, "I'm not sure I will be able to take care of myself at home." Who is the most appropriate team member to report this statement? The case manager is the most appropriate healthcare team member to report this kind of statement to, especially around discharge. An assessment may need to take place regarding the living and financial situation of the patient. The doctor and director of nursing would most likely refer the nurse back to the case manager, so it would be appropriate for the nurse to report this statement to the case manager first. 25. A nurse just started a blood transfusion for a patient with a Hemoglobin of 6. The patient says, "I feel hot, my stomach hurts, and I am having difficulty breathing." What should be the nurses first action? The first action should be to stop the transfusion immediately once the patient complains of any unusual symptoms. The patient is reporting symptoms of a transfusion reaction therefore the transfusion should be stopped to prevent the patient from worsening. The provider should be notified immediately after stopping the transfusion. Vital signs should be taken as quickly as possible or as instructed by the provider after the transfusion has been stopped and the physician has been notified. A code should be called if the patient becomes unresponsive. A rapid response could be called if the patient is at risk of destabilizing. 26. The patient has only one IV site with a continuous infusion of Lactated Ringers solution. The provider has prescribed Ceftriaxone 100 mg in Normal Saline 50 ml to be given IV now. What should be the nurse's first action? c.	Stop the Lactated Ringer's Solution and start the Ceftriaxone now. The nurse's first action after receiving the new IV medication order should be to check the Y-site compatibility of the two IV infusions. Depending upon the response, the nurse may need to start a new IV or run the medications into the same IV. In this case, the IV compatibility will show as incompatible for Lactated Ringers and Ceftriaxone, so these medications should not be run on the same IV line. If possible, the continuous infusion should not be stopped unless an IV access is obtained, or the physician gives the order to pause the continuous infusion while the antibiotic is given. 27. Which of the following lab tests would be considered Point of Care testing? A Blood Glucose would be considered a Point of Care test as the test can be completed at the bedside with the result given immediately. A Urinalysis, Sputum Culture, or Complete Metabolic Panel would not be considered Point of Care tests because these tests need to be run in a laboratory setting with specialized equipment not available at the bedside. 28. The nurse enters the room of a patient complaining of lower back pain after a left hip replacement surgery. What non-pharmacological intervention would not be appropriate? If possible, the patient should not be repositioned onto the side where the hip surgery took place as this may cause decreased circulation or improper healing to the hip or cause more pain to the patient. The patient can be repositioned from supine to the right side. Massage is an appropriate method for nursing staff to use in decreasing pain for the patient. It is appropriate to lower the head of the bed to elongate the patient's back. The patient's legs may be elevated to prevent swelling and pressure ulcers. The application of heat to a painful area is appropriate. It would be acceptable for the nurse to obtain a doctor's order prior to heat application. 29. The nurse notices a CNA using an alcohol-based hand sanitizer after walking out of a room marked as Enteric Contact Precautions. What should the nurse's response be? A room marked with Enteric Contact Precautions indicates that normal alcohol-based hand sanitizer will not remove the bacteria present in the room. Handwashing with soap and water should be used instead of hand sanitizer. A mask is not indicated with Enteric Contact Precautions. The CNA should dispose of gloves inside the room to contain the bacteria within the room, then hands should be washed with water and soap. 30. A nurse is making a Home Health visit at a home of an elderly couple. The wife states regarding her husband, the patient, "He always sits in that chair all day long." Which of the following should the nurse consider the patient at risk for? The patient is at risk for all the listed conditions related to decreased mobility. Pressure ulcers form as the skin layers break down between the chair or bed surface and bone. This may happen due to the patient remaining in one position too long. This patient may be at risk for pressure ulcers to his sacrum or areas where his leg meets the foot rest. Patients have been shown to be higher risk for Deep Vein Thrombosis with decreased mobility. The patient should ambulate multiple times a day to lower his risk for DVT. Constipation is another common side effect of decreased mobility as the GI system slows. 31. Which of the following statements to the Type 2 Diabetic patient by the nurse is correct? a. Eat less fruits and vegetables and more grains. b. Try to wear closed toe shoes whenever ambulating. c.	Minimize physical activity to prevent fatigue. d.	Check your blood sugar only after meals. The correct statement by the nurse is that the patient should wear closed toe shoes when ambulating. Patients with Diabetes are at high risk for impaired sensation in their lower extremities and may develop wounds that are difficult to heal. Patients with Diabetes should be encouraged to eat more fruits and vegetables as part of a healthy blood-sugar regulating diet. Increasing physical activity is another way the patient with Diabetes can regulate blood sugar levels. If the Diabetic patient is checking blood sugars, the levels would normally be checked prior to meals, typically to determine a dose of insulin. 32. A patient is being discharged with a new diagnosis of Congestive Heart Failure. Which of the following statements made by the patient indicate understanding of the diagnosis? a. "I can drink as much fluid as I want." b. "I should notify my doctor if my feet start to swell." c.	"Weight gain of 3-5 lbs in one day is to be expected." d.	"It is normally to have difficulty breathing at night." The patient should notify the physician if edema starts developing in the lower extremities. This indicates more pressure on the heart and can cause complications. Patients with Congestive Heart Failure need to have a limited fluid intake, typically around 2 L per day to prevent fluid overloading. The patient should be aware this includes all types of fluids, not just water. Weight gain of 3-5 lbs in one day should be reported to the physician as this is a significant weight increase and may indicate fluid retention. The patient's medications may need to be adjusted. The patient complaining of difficulty breathing at night is experiencing pulmonary edema, a condition in which fluid builds up into the lungs. This symptom should be reported to the physician immediately. 33. A nurse working in the telemetry unit receives a call that a patient's EKG rhythm has transitioned into Atrial Fibrillation. Which medication is the patient likely to receive long-term in relation to this diagnosis? Warfarin is a common medication given long-term in the management of Atrial Fibrillation to prevent the development of blood clot, or thromboses, that can cause blockages in the heart or lungs. Heparin, while used to prevent thrombosis in Atrial Fibrillation, is not usually administered long-term as it is an IV or Sub-cutaneous injection. Furosemide is given as a diuretic in decreasing fluid retention. It is normally given to patients with Congestive Heart Failure. Albuterol is typically a drug that is inhaled in the treatment of Chronic Obstructive Pulmonary Medication or Asthma as a rescue medication. It is contraindicated in Atrial Fibrillation. 34. A patient has Incentive Spirometry ordered QID x 10 breaths after a cholecystectomy. The patient is asking why they need to perform this action. Which of the following would Not be a reason the patient should use the Incentive Spirometer? Using an Incentive Spirometer will increase lung capacity, opening the bronchioles, and allowing for better oxygenation throughout the body. Using an Incentive Spirometer gently exercises the lungs and will encourage the patient to take long and deep breaths instead of short and shallow breaths which are common following surgery. Maintaining adequately expanded lungs and allow better oxygenation through the blood stream will improve recovery times, allowing for the patient to start ambulating sooner as well as encourage proper healing to the surgical site. Incentive Spirometry use prevents pneumonia be keeping bronchioles open and clear, minimizing the sustainable environment for pneumonia to develop. 35. A nurse is changing the dressing for a post-op Bilateral Knee Amputation patient. The nurse notes the patient refuses to look at the limb while the dressing is being changed but asks the nurse about their personal life instead. Which nursing care plan should the nurse implement for the patient related to this action? A patient with loss of limb may be experiencing Disturbed Body Image. The nurse should be sensitive to the patient's emotional and mental acceptance of the loss and incorporate therapeutic communication as the patient allows. Acceptance may take time and the patient should not be pressured into looking at the limb. The patient may be experiencing Altered Sleep Patterns related to the surgery, however the patient refusing to look at the limb indicates Disturbed Body Image. The patient remembers the limb is there and is refusing to look at it, therefore Impaired Memory does not appear to be the issue. The patient does not appear to have any issues communicating with the nurse, so the patient is more likely experiencing Disturbed Body Image related to the loss of the limb rather than Impaired Social Interaction. 36. Which method should be the last resort in assisting a patient who is experiencing mild anxiety? Non-pharmacological methods should be used prior to pharmacological methods. Haldol is normally given to patients experiencing severe anxiety or agitation and should be used as a last resort. A patient may benefit from the nurse sitting with them and providing calm conversation over the anxiety-causing issue. Deep-breathing is well-known calming technique used to calm the nervous system and can help in cases of anxiety or panic attacks. Progressive Muscle Relaxation can be used to encourage the patient into a more relaxed state. The nurse can assist the patient to lay on the bed and provide instructions to the patient in a slow calm voice. Progressive Muscle Relaxation would be helpful for mild anxiety.